My apartment is still filled with way too many unpacked boxes which is making me a little crazy. Trying to look on the bright side, I'm blogging about what I have gotten done, like Zoe's side of the bedroom. Yesterday, besides getting a haircut, I also got the top of the desk decorated. 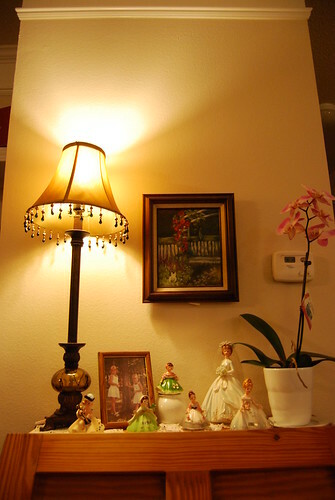 When you walk in the door, it's one of the first things you see so it's a good place to make look nice. Here's the view of the whole thing. Joel gave me the orchid when I got home from Washington. I think it's so pretty and works really well in this space. Let's just hope I don't kill it! 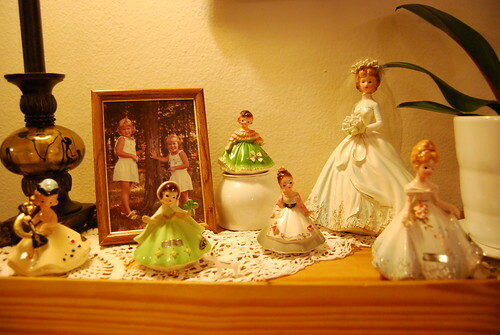 My grandma gave me the "Josef Originals" figurines, the crocheted doilies, and the photo of my sister and me. The doilies were made by either my great-grandma or my great-great-grandma. Since I crochet, I think it's pretty special to have some of their work. 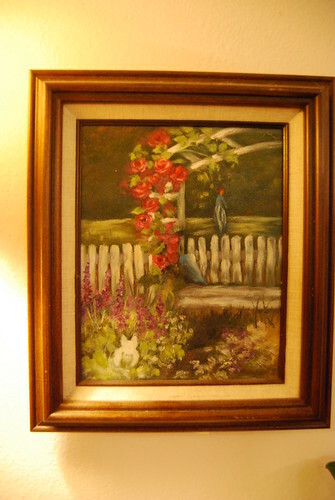 This painting was done by my Aunt Mildred and given to us by her as a wedding gift. I absolutely love it. That's all for today. Hopefully I get some more organizing and decorating done soon so I'll have more to show everyone. In the meantime, don't forget to enter my CONTEST for a chance to win your very own handmade crocheted animal.